The original high performance part for the Samurai is the 32/36 carburetor. It has always been recognized as the easiest and most affordable carb kit in terms of performance. Expect a 24% horsepower boost which turn into a night and day difference from the stock carb unit. The higher CFM (cubic feet per minute) of the EMPI over the stock carb makes for better acceleration without hesitation or the inherent flat spot experienced with the factory carburetor. Your mileage will not suffer with this carb, depending on driving style. 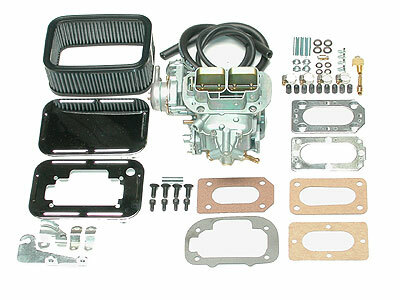 The complete kit comes with the pre-jetted 32/36 EMPI carb, chrome air filter(SS601) base adapter plate, complete gasket kit, throttle linkage, support brackets and complete step by step instructions.